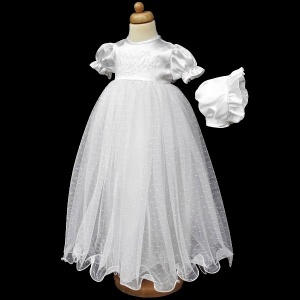 Baby girls white long gown with matching bonnet, perfect for your baby girls christening baptism day. 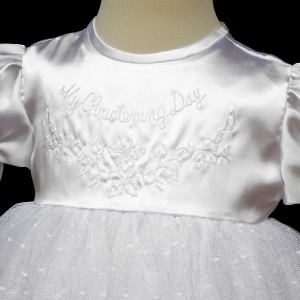 Gown: This pure white gown has a satin bodice which is embroidered with 'My Christening Day' on the front. 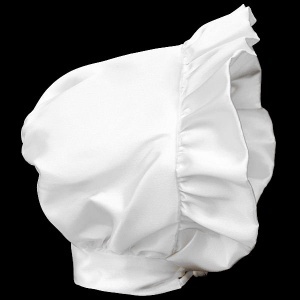 A satin sash beautifully ties around the back into a bow. This gown has short puff elasticated sleeves with a discreet zip fastening at the back. Triple-layered overskirts for fullness - two layers of large fluttered net tulle with polka dots all over with a satin underlay.